As dean of the beer cookbook authors, Lucy Saunders has spent a career innovating while encouraging readers and home cooks to think about beer in new ways. 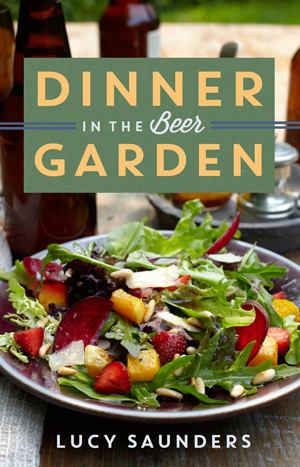 Dinner in the Beer Garden shows the healthier and more sustainable side of things, with dishes mainly focusing on vegetables and fruits. There are also engaging brewery and restaurant profiles sprinkled throughout, adding personality to the already inspiring writing. The recipes range from curried couscous with roasted shiitakes to chocolate burnt caramel cream shortcakes. With flavors that burst with each bite, no one will be missing the meat.